The sun is mostly composed of the elements hydrogen (H) and helium (He). By mass the composition of the sun is 75 percent hydrogen and 25 percent helium. Various metals make up less than 0.1 percent of the mass of the sun. 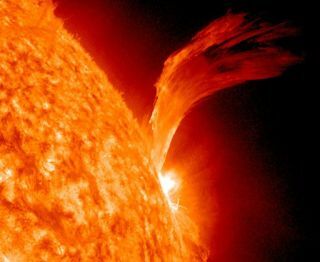 The temperature of the sun’s surface is about 10,340 degrees Fahrenheit (5,726 degrees Celsius).